I love this pastel pink tulip that has surprised me by returning this spring! 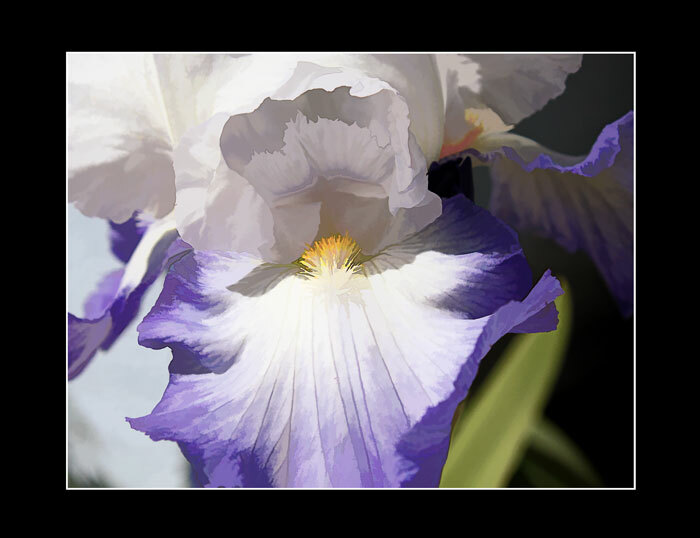 Processed in Photoshop Elements 6. I used the lasso tool to choose just the blossom and ran a pale pink gradient on it to punch it up ever so slightly. Then I ran a layer of Topaz Simplify cartoon (custom setting) and layered it on top with a Screen blending mode at 35% Opacity. Some slight burning was done and the outline added. Have a great day! Camera settings: Canon EOS Rebel T1i, F/8, 1/400 sec., ISO 100, focal length 100 mm. No flash. With this photograph I used several layers and steps to produce the final result. I adjusted levels, applied Topaz Simplify buz sim, duplicated, changed to b/w (newspaper), used filter/stylize/find edges, set blend mode to linear burn at 70% opacity and burned. All done in Photoshop Elements 6. The edge was created using a white stipple brush. The tree blossoms are almost all done now. Rain is expected at the end of the week. Have a good day everyone! Camera settings: Canon EOS Rebel T1i, F/13, 1/250 sec., ISO 160, focal length 200 mm. No flash. Processed in Photoshop Elements 6 with Topaz Simplify oil painting adjusted. This was also levels adjusted and burned. Camera settings: Canon EOS Rebel T1i, F/7.1, 1/60 sec., ISO 100, focal length 100 mm. No flash. My husband and I took a ride yesterday to the gold country of California. We found this old mining wagon in the town of Columbia. Processed in Photoshop Elements 6 with adjusted levels and Topaz Simplify buz sim. I raised the contrast just a tad. Camera settings: Canon EOS Rebel T1i, F/5, 1/500 sec., ISO 100, focal length 55 mm. No flash.